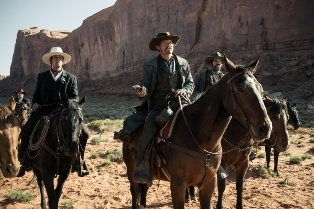 The Lone Ranger follows in a long line of modern reboots of pop-culture icons of the past. The Lone Ranger was born on the radio in 1933, moving to television in 1949. 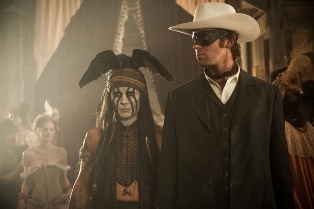 The character, along with his Native American sidekick Tonto and trusty horse Silver, has appeared in numerous books and comics as well as three theatrical motion pictures, prior to this newest incarnation starring Armie Hammer and Johnny Depp. The film has been getting crucified by critics. Perhaps it was going into the film with low expectations and little anticipation, but I didn’t think the film was that bad. Yes, at two and a half hours it is overlong and suffers from an inconsistent tone, but on the whole I found it fairly enjoyable to watch. The story follows the established legend, with John Reid (Hammer) donning the infamous mask as he embarks on a quest to avenge the death of his older brother Dan (James Badge Dale) at the hands of the evil Butch Cavendish (William Fitchner). 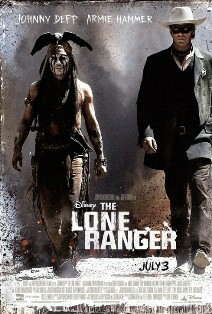 The Lone Ranger teams up with Tonto (Depp), a Comanche warrior who also has a longstanding beef with Cavendish. From there the film is an odd mishmash of traditional Western, modern action film, and slapstick comedy. The styles don’t always fit together, at times pairing humor with grisly outlaw violence. Things open with a rousing bang with a train hijacking by Cavendish’s gang. Both Cavendish and Tonto are being held prisoner, with Reid inadvertently helping free both. It’s a crackerjack action sequence that leads to an exciting chase as the Reid brothers try to track down Cavendish. Too bad the whole movie can’t maintain the pace. A relatively sedate backstory does allow for some welcome character development (including Tonto’s a sad tale involving a very ill-advised trade). This helps provide our heroes some depth, but the pedestrian storytelling is uninspired. The crux of the story is that railroad magnate Latham Cole (Tom Wilkinson) is laying tracks through Comanche territory in order to ship out as much silver ore as possible. The big problem with the casting is Johnny Depp, who remains pancaked with makeup in an attempt to disguise the fact that the actor is not Native American. It’s shocking that in 2013, roles conceived for ethnic minorities are still being given to white actors. Depp, to his credit, mostly underplays, instilling Tonto with sort of a Zen stillness as he dodges obstacles during the action scenes. However, perhaps it would’ve been more fair to cast an actual Native American and save the star power for the title role. Armie Hammer is a curious choice for a mega-budget summer blockbuster (or at least attempted blockbuster, as the initial box office receipts suggest it will fall far short of that status). It’s not that he’s unlikeable, but that he has to wait so long to fully inhabit the character. Reid is resistant to attempt any real derring-do until the film’s climax. But what a climax it is. With the famous theme music (“The William Tell Overture”) blaring throughout, the Ranger – atop the supernaturally-gifted Silver – and Tonto finally bust out of the monotony in order to save the day. Coming after a stop-and-start two hours of build-up, the extended set piece feels even more exciting than it likely would’ve in a tighter-paced film. The first place to trim, by the way, should’ve been omitting the Little Big Man-style framing device, with an aged Tonto on display in a museum, conversing with an overly earnest young boy (calling into question whether Tonto is spinning some sort of legend rather than telling an accurate tale). These scenes, with Depp’s makeup giving him the look of a burn victim rather than an old man, don’t do much more than needlessly extend an already indulgent running time. This movie looks like it’s going to be a good one. I had no idea that Johnny Depp was in this. What an added surprise.